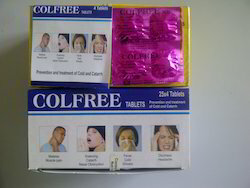 Offering you a complete choice of products which include colfree tablets. Treatment Fever, headache, malaise etc. These are excellent for prevention and treatment from cold and catarrh and other symptoms of fever, headache, malaise etc. Looking for Analgesic Tablets ?